Originally published under the title "'Justice' in Turkey." Turkey changes, and it does not. The oppressors change; oppression does not. Every Turkish courtroom sports in big, bold letters the proud dictum: "Justice is the foundation of the state." Perhaps that explains why the Turkish state looks like a makeshift building without a proper foundation. In Turkey, the ruling ideology has changed from one belief to another. The bête noire for the state also changed -- in line with what the dominant ideology has crowned, or what is perceived as threat. Between 1923, when Ataturk built modern Turkey, and 2002, when the (Islamist) Justice and Development Party [AKP] came to power, the usual suspects were the liberals, Islamists, non-Muslim minorities, communists, Kurds and random dissidents. The state machinery often effectively used law enforcement authorities and the justice system to punish the "internal threats" to the state's own survivability. Government bigwigs, judges and generals were largely the "untouchables." In 2002, this author was given a 20-month suspended prison sentence for an article criticizing corruption in the judiciary. In 2005, the Court of Appeals approved the sentence. The AKP's rise to, and consolidation of, power reshuffled the usual suspects and the dominant ideology, but left random punishment unchanged. The AKP's rise to, and consolidation of, power reshuffled the usual suspects and the dominant ideology, but left random punishment unchanged. Only a month ago, a university professor of astronomy was put behind bars for not allowing female students to take his classes because they wore the Islamic headscarf. The legal case for the campus ban on the headscarf is complicated. There is still a valid ruling from the Constitutional Court that favors the ban; and a ruling from the European Court of Human Rights that says the ban does not constitute a violation of rights. But there is also a parliamentary decision that legalizes the headscarf on campus. The professor of astronomy went to jail because he thought the supreme court's decision overruled the bill that passed in parliament. Before the AKP, female students with headscarves were punished for manifesting Islamist headgear (and ideology). Today, secular professors are punished for not allowing Islamist headgear. Similarly, after the AKP consolidated power in the late 2000s, after successive election victories, and "tamed" the secular generals, its staunchest Islamist allies, known as "Gulenists," launched a law enforcement and judicial campaign to "liquidate" hundreds of generals, officers, journalists and academics. The Gulenists had infiltrated into the higher ranks of both the police force and the judiciary, and are widely believed to have fabricated evidence to prosecute anti-Islamist groups on charges that they plotted a coup d'état against the AKP government. Scenes of top brass generals, including a former chief of the military, prominent journalists, writers and intellectuals being arrested at police raids, usually at dawn, traumatized much of the Turkish society. On December 14, 2014, Turkey woke up to the same scenes, but this time the victims were the Gulenists themselves. The first signs of cracks between the AKP and Gulenists appeared in 2012. Due to ideological differences, and what looked like an apparent power-sharing battle, the allies were no longer allies. At the end of 2013, the war was "official": secretive sources, believed to be Gulenists, started to leak embarrassing audio recordings implicating serious graft involving (then) Prime Minister Recep Tayyip Erdogan, his family and four ministers in his cabinet. In the local elections of March 2014, Erdogan's AKP won a comfortable 43.3% of the vote. That vote, and Erdogan's subsequent victory in presidential elections in August, marked not just a bad, but a dramatic, omen for the Gulenists. Erdogan, in almost every public speech he made, vowed revenge. Last week, Erdogan implied that the Gulenists were conspiring against Turkey, "with the southern country which they love," an apparent reference to Israel. In the early hours of Sunday, December 14, the police detained 31 people, including prominent media figures and high-ranking police officers, all believed to be members of the Gulen movement. Its leader, Futhullah Gulen, lives in self-exile in Pennsylvania, where he runs an empire of charters schools in the U.S. and half the globe, media outlets and companies, such as the Gulenists' flagship daily newspaper in Turkey, Zaman; its English language version, Today's Zaman, and the Samanyolu media group. Zaman's editor-in-chief, Ekrem Dumanli, was among the detainees charged with "setting up an illegal organization in order to destroy Turkey's democratic regime." Shortly before his arrest, Dumanli made a speech, broadcast live on television, defiantly calling on the police to detain him. Dumanli said that he was being accused of "traveling to Israel and Brussels" shortly before the leak campaign began in December 2013. 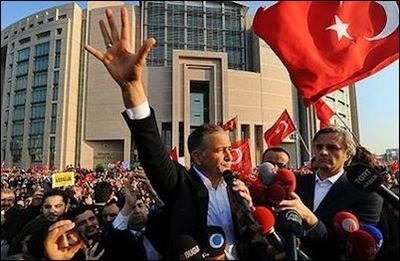 The charge was a sign of government claims that Israel and the EU were part of efforts to topple the AKP government. He said he did not travel to Israel, although as an editor-in-chief, he often went to Brussels. Former Gulenist foes, journalists who had been detained by allegedly Gulenist judges but were later released, tweeted in solidarity: "This is time to fight fascism. No matter who the victims are." Hidayet Karaca, the head of Gulen's Samanyolu media group -- and a producer, scriptwriter and director -- was also detained, as well as Tufan Erguder, the former head of the Istanbul Police Department's anti-terror branch. "The detentions have been ordered [for the people on the list] in order to take their testimonies on charges of founding and directing an armed terror organization, being a member of this organization, and engaging in forgery and slander," a statement from the prosecutor's office said. And hell broke loose. Two leading journalists' associations and trade unions and the main opposition condemned the detentions. The U.S. and EU expressed concern about media freedom and the independence of the judiciary in Turkey. Former Gulenist foes, journalists who had been detained by allegedly Gulenist judges but were later released, tweeted in solidarity: "This is time to fight fascism. No matter who the victims are." In return, the Gulenists thanked them shyly. "Forgive us... We did not defend your freedoms a few years ago as you are defending ours today," one Zaman editor tweeted. The Crescent and Star looks like Giuseppe Tomasi di Lampedusa's famous novel The Leopard (Il Gattopardo). One of the most memorable lines in the book is spoken by the protagonist's nephew, urging his uncle unsuccessfully to abandon his allegiance to the disintegrating Kingdom of the Two Sicilies, to ally himself with Giuseppe Garibaldi and the House of Savoy: "If we want things to stay as they are," he says, "they will have to change."